In many ways, “field position” is more important than many or most other things. This is true of management, where bad management can survive at relatively higher levels in an organization than the better folks under them due to their ‘field position’. As long as they do not too obviously screw up, the superior underling has a very hard time getting past them. It is true in sports, where field position can determine who wins and who loses on any given play. It is very true in military engagements where it’s been known for generations that the general who “prepares the battle space” or “selects his field of battle” wins more than the one that “takes what his enemy gives him” and runs headlong into a field not of his choosing. It is also a ‘truism’ in real estate where it’s known by the phrase / joke line: “There are only three things that matter in Real Estate: Location, Location and Location”. And Where I Am Now? I’ve been living in hotels along highway 192 in Florida. That is the major highway that passes under the southern edge of Disney World (which has several “gates” at slightly different locations along the sort of southern edge). Depending on how close to a ‘gate’ one is, the property makes more money as it can charge more. That the “east gate” and the “south gate” both dump onto roads near highway 192, as does the ‘west gate’, makes for an interesting topology of ‘relative worth’. Disney learned from Disneyland where a load of hotels popped up all around the “park” and raked in a load of cash. As much or more than Disneyland in some cases. It also limited the ability to expand the space as they were ringed by folks uninterested in selling. So in Disney World, Disney bought a LOT of land. About 40 square miles. ( 30,080 acres, 47 square miles, or 121.7 square km per the wiki). Pretty much ALL the non-Disney hotels are a pretty good distance away from any of the ‘attractions’. It can take a half hour just to cross the “property”. To quote the Microsoft Website when talking about a bug in “Windows” that I was once investigating “This behavior is by design”. In this case, it is No Bug. It’s a feature. A goldmine of a feature. I just finished a week in the Polynesian hotel “on property” and on the monorail line. It was several hundred dollars a day (after a discount from a friend / ‘cast member’) and with a mediocre ‘garden view’ (that is, not looking at the park, lake, or interesting things). Full price ranged from about $400 up to over $1000 Per DAY. Prices were higher at the “Contemporary” (a somewhat less interesting and dated hotel, but with more altitude so the views are much better, especially in the higher floors) and significantly higher in The Floridian (both being completely sold out even in ‘off season’). Even off property a couple of miles way, it was still over $89 / night. Still, that is a BIG price ramp from $1000 / night. There were a couple of ‘residence inns’ that were $1100 and $2100 (roughly) a month located a couple of miles out that east gate direction. Their “day rates” were in the “around $100” range. One on each side. So, back to Highway 192. This highway was the main approach for folks driving in from the rest of the country for several years. Eventually the Florida Turnpike sent more folks down the center of the state and fed them over toward I-4 and “Hotel Row”. There had been a big growth of “mom and pop” hotels along highway 192, along with a zoo of restaurants and ‘minor attractions’ as folks made cheaper alternatives for families to visit after paying the ticket price to Disney for a few days (presently $89 / day ). This was so popular that the local city put up ‘mile markers’ along the highway that mark how far you are from the entrance to Disney. (Based off of the first one encountered toward the south west). These are large blue signs proclaiming Mile Marker (FOO) at each mile. My hotel is just after Mile Marker 10, so I’m in the ‘OK but not great’ location. I’m paying $189 + Tax per week for a fairly good Travelodge. At about Mile Marker 8, there is Motel 6 (cheap, but clean simple rooms, nothing to brag about) that can get over $200 for a much lesser room. As you get to lower markers, prices rise. Downstream from me, at about Mile Marker 11 to 12, the prices drop to the $179 – $159 – $149 range. I’ve got a couple of images below for evidence. As these prices will change over time, I figured I’d better document them. $179 per week, but note the first week is $159. I stopped at this restaurant and had lunch in the attached Mexican Restaurant. I was the only customer, but it was at 3 pm so not exactly prime time. The food was quite good and authentic Mexican. Talking with the owners, who were cooking and waiting tables, confirmed slow business AND their authenticity as Mexicans. They rent the space from the hotel, so next I checked out the hotel. There is also a neat Inflation Indicator built in here too. In most parts of the country, the Motel 6 room runs about $55 to $60 as we’ve had about a 95% reduction in the value of the $US from inflation. That these folks are running way below that price point is clear evidence that there is excess competition at play. You can also use the local Motel 6 price as a convenient local relative inflation / price indicator. Often while driving cross country I’ll watch the Motel 6 signs rise and fall in prices with the local economic strength. At that $150 / week rate, we’re talking a bit over $20 a day. (about $21.42) That’s not much, and a very long ways from the $80 range one would expect from history. It will cover the basic costs, if you collect it from enough folks, but not make much profit. Perhaps not even enough to pay for maintenance or keep the power on to the AC in all the rooms. The Death Spiral can begin if you don’t make enough in “high season” to coast through “low season”. When an economic downturn or recession hits, the most marginal players in a space suffer first. During good times, they can make decent money even if located far from the economic heart, as some folks ‘spill over’ from full hotels and as some folks just can’t pay the rates charged by better positioned players. Last time I was working here was a few years back, before the economic downturn. That Motel 6 was charging about $46 / day (IIRC). The Travel Lodge was about $60 something, more for the better rooms, and some were up to $80. 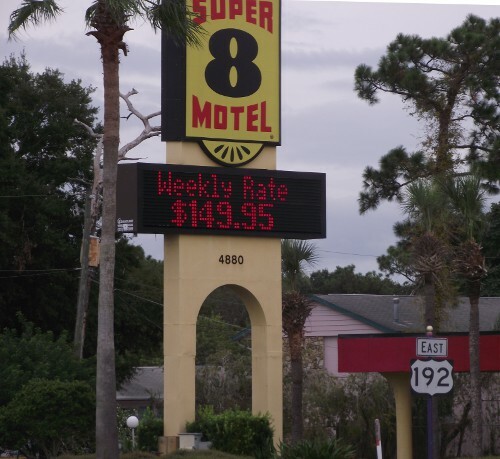 The Super 8 was about $50 a night off nights, higher on prime nights. I ended up further down the road in the ‘cheap seats’. I found rooms at about $25 to $28 a night that were ‘not too bad’. Clean. Odor free. Nothing fancy, but reasonable and fun. Often with the ‘secondary entertainment’ nearby. That was from about Mile Marker 12 to 16 or so. I could put up with the 15 mile ‘commute’ (I was working in Celebration then) for the lower cost. $20 / night covers 10 miles pretty easily. So what does that area look like now? This is a low rez picture, but still will be bigger when you click on it to open. If anyone wants the full rez, I can upload it. I stayed in that hotel. It was a nice place with a slightly dated decoration, but still it was kind of fun. Now it’s dead. The mini-golf next to it is rapidly being overgrown. Across the street and down the road just a ways was a Really Nice Sushi Place. I don’t remember the name, but I had sushi there about once a week. Dropped about $50 a time. Very well appointed and with great service. Since then it clearly fell on hard times and was converted to a Hispanic theme. My guess is it was trying to attract a lower price point customer base as the ‘upscale’ price point folks stopped driving this far down the road. But even that failed to be enough. The hotel next to it is also now closed. (This is a small picture and will not get bigger if you click on it). I’d hoped to have sushi there again, but it was not to be. Why can Disney get $1000 a night and the others are gone? I spent a bit of time pondering ‘why’. I think I know. During economic downturns, The Fed inevitably does things that cheapen the $US Dollar vs the rest of the world. Europe, in particular, takes a Florida Vacation in droves. At the same time, the US population stays home. Folks who fly in from Europe (and Australia) have typically bought a ‘package’ and are not interested in a rental car to search for lower cost hotels. What “drive ins” there are, stop sooner as they reach their ‘price point’ sooner along the road. 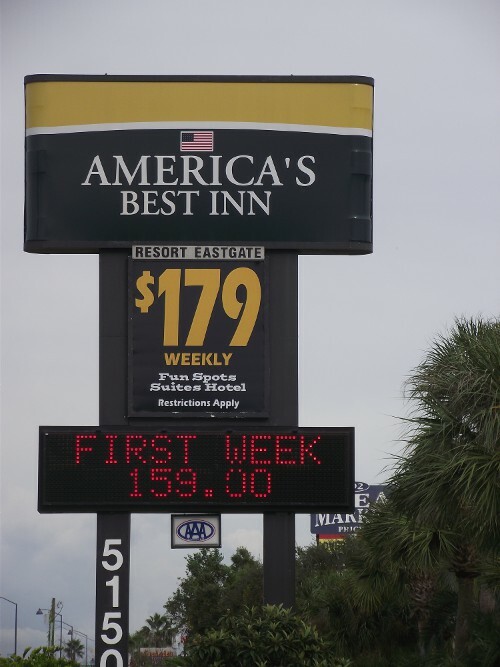 Why drive to mile marker 15 if you can get a nice room for $189/week at marker 10? Things fill up from the center out. The “fly ins” never get much off of “Hotel Row”. It’s all about the Fly vs Drive populations and the shift from ‘drive in’ to ‘fly in’ as the foreign exchange rates shift the customer base. But this time is even worse than the times before. This time fuel costs have risen dramatically for driving in. So much, in fact, that when I was out here about a year ago, I left the car at a friends home and flew back. “Depot” of a car was cheaper than a round trip by car. (About $700 to $800 of gas at best, up to $900 at times). Compared to a $250 air fare (off peak flying round trip), and the $98 I spent to fly back on the 4th of July holiday, driving in is now significantly limited with distance. Basically, even the US visitors from much beyond Dallas or Virginia are likely to fly in. Fly in folks want a hotel close to, or on, property and with minimal travel time to the parks. They are willing to go ‘upscale’ on the hotel instead of burning the money as gasoline. Added to the general downturn, and the fact that $89 in Euro isn’t that much but in $US if you are on ‘hard times’ it is just crazy, well, the drive in population has just plunged. Yet Disney is still ‘booked up’ and raking it in at $1000 / night. BUT, if you count up the number of rooms, it’s at most measured in the 1000s. Take the global population of several billion. How many of them are “Millionaires” or better? WAY more than 1000s. Even de-weighting it by various factors for frequency of park visits and for multiple destinations, the fact is that there are far more folks who are very rich and can spend $1000 a night “just to have the closest room with the best view”. Take 1,000,000,000 people / families in the developed world. Say you de-weight by 100 for the number of weeks in a year (yes, it’s double so as to be pessimistic). That’s still 10,000,000. Say you only get 1% market penetration. The 1% richest. That’s 100,000 in any one week. Chop it by 10 to allow for multiple parks and /or fewer rich folks than you might expect. That means only 1 in 10 of the very rich who might want that room can actually get it. Prices rise to the point where some of THEM decide it’s just too expensive and a trip to Brazil is more interesting… That’s WAY more than most of the rest of us can ever think of paying. In essence, the better Disney rooms are reserved for the very very privileged classes, though you can buy your way in if you are crazy with your money. Some “middle class” folks will pop the $7000 for a ‘trip of a lifetime’. (Some of the rest of us will take the ‘lesser good room’ if we can get a special in / discount). In the end, even in an economic downturn, when others are folding and going out of business; Disney will continue to make very outsized profits. While the folks at the end of the road cease to exist. And it all comes down to the Power of Position. This entry was posted in Economics - Trading - and Money and tagged economics, entertainment, hotels. Bookmark the permalink. A friend of mine just paid a visit Florida (when Iris was off the Florida coast) to take his daughter to the amusement parks and museums. He didn’t book a package deal but bought all the required services separate on the internet. He booked his hotel via internet only paying 156 US for an entire week (three persons including breakfast). Most money was spend on the attractions. People buying services directly via the internet seems to be the latest trend beating the package deals. I personally haven’t booked a package deal in my life. I always book a flight and arrange my hotel and local transport myself depending on the country and the location I visit. The last time he visited Florida was 20 years ago and his impression was that the big theme parks had reduced the number of attractions and the current crises had become clearly visible without mentioning any specifics. Oh yes, before I forget it, the weather sucked but hey, who controls the weather. I will meet him this week to watch the inevitable holiday pictures and video’s and get some more details about his trip. Really interesting information, I had no idea that people would pay such crazy prices. May I recommend that you head east on 192 until you hit Wickham Road in Melbourne and then head north until you reach Jordan Blass Road. Turn left at the light by the “Bank of America”. The excellent “Charlie & Jakes” is only 100 yards away, truly a different world where you still get real value for money. The “Happy Hour” runs from 4 to 7 p.m. so you can get “Two-fers” of wonderful beers that are brewed on the premises. It will take you an hour each way but it will be worth it. Learned that in high school economics !!! Staying at the Bay Lake Towers was priceless given that it was walking distance to the Kingdom. Would LOVE to stay at the Floridian, but that is out of the budget. Oddly (or maybe not so oddly…) the hotels IN Kissimmee are not going under. There were originally a bit too far away to get anything other than extreme overflow from park visitors, so have suffered less in their absence. About Marker 18 plus it starts getting better again. I did notice that the general population there was a bit ‘rougher’. So it’s had some decline. But is surviving. And, yes, the internet is going to change (has changed?) things a lot in this business. Folks can get accurate miles distances, can see the multiple gates, can compare prices. The arrival of Universal and some of the other parks has also shifted the topology more northward. Kissimmee tried to capture some of that effect with added attractions, but they are small scale things like Old Town; and just don’t have the impact of a Universal or Sea World. What first caught my attention here was that it was NOT circles. There is one locus of very high cost on the inner monorail loop. Another for newer hotels built near newer attractions (like Downtown DIsney and the Sports park). Then it ‘goes wonky’ as there are at least 4 gates. The “West Gate” is off of 429, a toll road, and only really gets folks commuting to work and a few folks as they arrive off the Turnpike and took that road rather than I-4. Nothing built up there as Disney owns the land and had not built. (They are building a bit of roads, but no hotels… yet…) So that Gate does NOT have a load of ‘stuff’ at the end of it. The Celebration Gate (it probably has some other real name) is next. Disney owns the land nearest to it (and connecting to Celebration) so there is a pod of non-Disney hotels West of there. Prices a bit more consistent in the pod (as it is flanked by gates – though a bit far away) but lower than those close in further down the road. IN Celebration prices rise again, and stay high a bit to the east of it. Somewhere in there is marker 1. But the smooth topology is broken up by Disney owned and undeveloped ‘buffer land’. It introduces non-concentric banding. Basically, if you are 10 miles out already, the difference between 10 and 12 isn’t all that important. So you tend to get ‘pod pricing’ in those isolated pods. The expected variation with quality or rank of hotel takes over. At the “Main Gate” that I’d also call the South Gate, you get the expected topology, but there is a semi-steady zone as you approach 536. A bit of drop with distance, but you are both leaving the Main Gate and approaching that East Gate (but most folks don’t seem to know about it and it’s a minor gate into Hotel Row… either that, or the fact that it’s 15 minutes to get back to The Magic Kingdom AFTER to reach the gate dampens things). At any rate, at that point (about at that Super 8) highway 192 is just leaving all gates behind. That’s where the damage is worst. But, yes, it’s the same driver and same effect as “concentric circles”, just with some topology distortions from the size of Disney World and the internal development decisions. Oh, and the buffer zones. So you could actually make a ‘map of success’ out of it if you tried. Outside their front door now about to enter, posting this from their WiFi in the parking lot! Suds Ho!